When Helene Steene looks out on the Aegean Sea from her home in Greece, she sees many things. She sees serenity without distractions. A force that has given and taken life. And she sees beauty beyond words, which is fine, because she doesn't work in words. 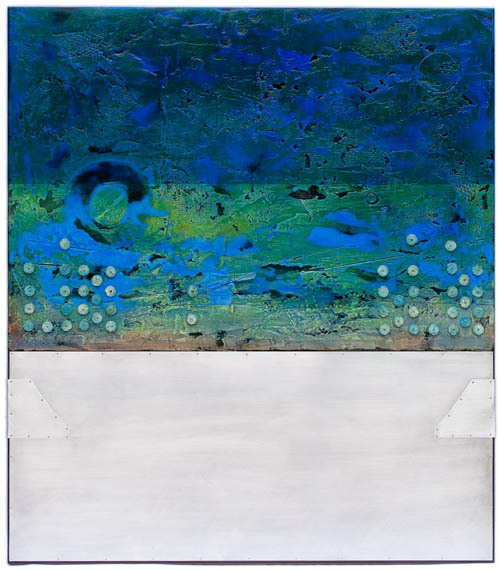 Steene, who is based in Lexington, works in images, and her new show at the Headley-Whitney Museum, Aegean Echoes, is a window into her spiritual home. "Where I am, if this is the house, the sea is by that wall," Steene says, standing on one side of the Headley-Whitney's main gallery and pointing to the other side. "It's that close, and I have this amazing vista of the horizon, and I spend a lot of time sitting and staring at the water. It is very contemplative to me." It also provided Steene with a lot of images to bring to her medium, primarily wood, metal and paint. In addition to filling the Headley-Whitney's main gallery, Aegean Echoeslaunches a new initiative for the museum, which is a gorgeous 10- to 15-minute drive down Old Frankfort Pike from downtown Lexington. "We have always shown different local artists," said Amy Gundrum Greene, the Headley-Whitney's director and curator. "We decided to do a more obvious return to local artists and featuring local artists. "It's important for museums to be tied to their community and display work from their community. We are hoping by displaying art from the community, more people will come out and support us." The idea is not just exhibits. Greene says the museum aims to build events around exhibits, at least one each month of the display, to help highlight the work and the artist. 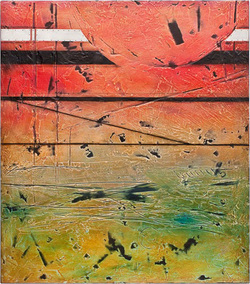 Aegean Echoes will start with an opening reception Sunday night. In September, it will host the annual fundraiser for Panagia Pantovasilissa Greek Orthodox Church. October will featureAegean Echoes Inspired, an event with dance and poetry interpreting Steene's exhibit. In November, there will be a dance party with flamenco fusion band Alma Gitana. "I think this really has the possibility of bringing the community closer together," Steene says. 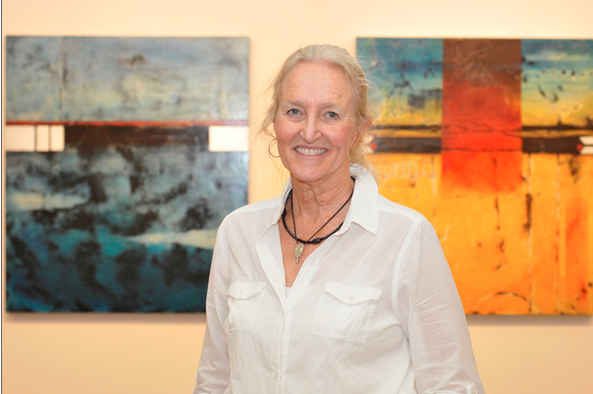 Her exhibit is preceded by short displays by area artists Ray Papka and Deborah Westerfield. She says she is particularly interested to see what the poets for October's event, including Bianca Spriggs and Katerina Stoykova-Klemer, come up with in response to the exhibit. "When I paint, I don't think in words at all," she says. "When the poets came here, I was very interested in their process, because they're trained to think in words." 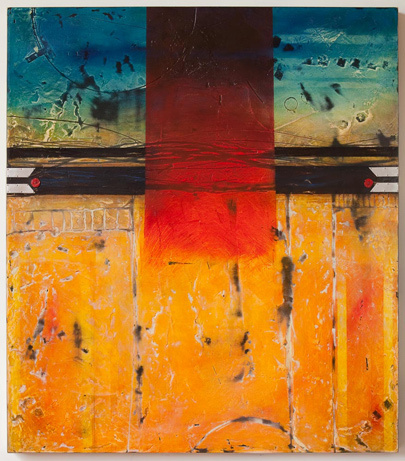 Steene's work is driven by the image, from the texture of her surfaces to the colors with which she paints. "The mood of the scraping that I do first really influences what happens," Steene says. The Aegean Pink Skies Fresco illustrates her point. It's a half-sphere carved into the top of the wood, forming a sort of late-day sun, and horizontal lines define a horizon where the image dissolves into a rough green. Looking around the room, Steene says that most of the images have a horizon line, reflective of the oceanic echoes. The echoes are audible, with a sound installation by University of Kentucky music student Jay Crutcher that plays in the room. "My son said you can have everyone with earplugs and the music on their iPhones, and I said, 'No, that's not the way I want it,'" Steene says. "I wanted it in the room." Crutcher's keyboard sounds slowly wash across the room, with occasional pings and rings echoing in the distance. 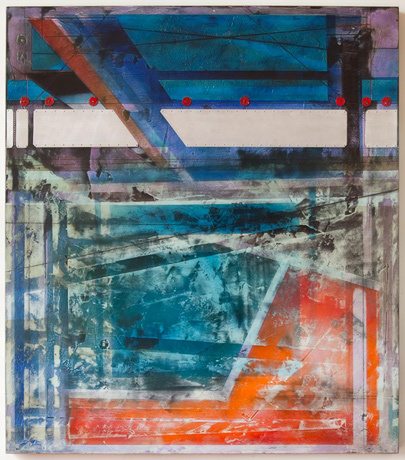 "Even though the colors are bright, I don't see my work at all as aggressive," Steene says. "It's a beauty to me when you're centered and it's all there. He's after that same kind of place." Steene works through her pieces methodically, starting with the wood and scraping and then adding color, all the way to the edges. She knows her medium well, but she says she is very much a process artist, enjoying the revelations that come as she creates new works. "That to me is where painting is fun, because you're hanging on the edge and you don't really know where you're going to go with things," Steene says. She points to a portion of Red Veil Fresco that employs a much brighter shade of red than she normally works with. As she worked it into the piece, she became excited by how it defined the work, and by a small splash of red in the lower right-hand corner of the work. "I get excited over small things," Steene says, laughing. But in the context of the Headley-Whitney's new show, Aegean Echoes has become a big deal.